Machines can’t bake soufflés or fold burritos . . . yet. 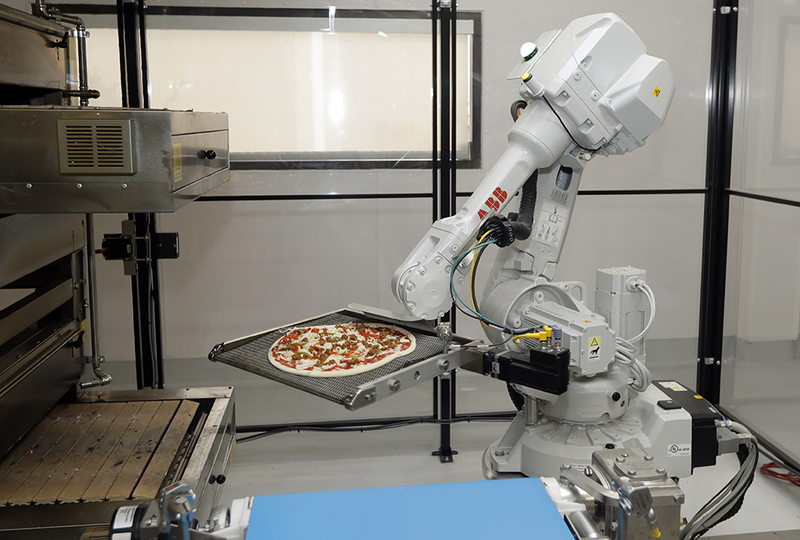 But in eateries popping up around the country, robotic chefs are steaming veggies and slinging pizza sauce. What’s cooking at state-of-the-art restaurants like Spyce and Zume may soon appear in a kitchen near you. 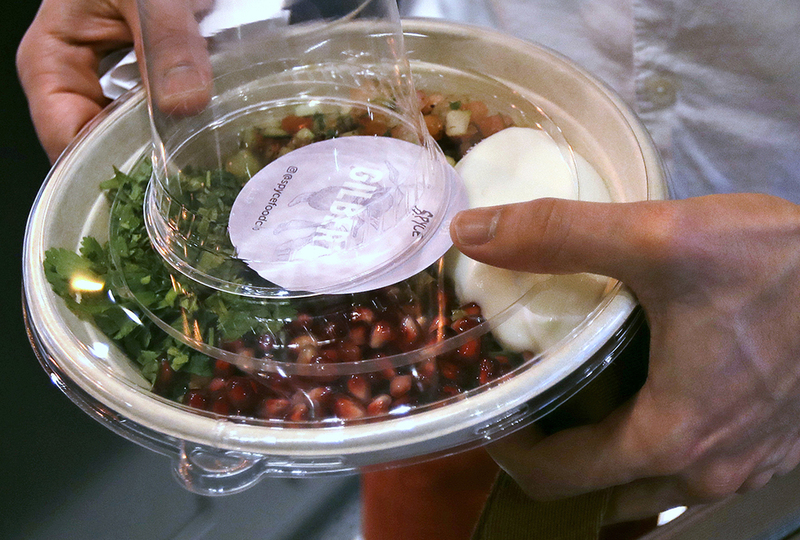 Customers at Spyce, a fast-casual Boston eatery, watch as prepared Brussels sprouts, quinoa, kale, and sweet potatoes tumble into one of seven swirling vessels. Each pot heats the food and plops it into a waiting bowl. Presto! A machine-made meal. At Zume Pizza in Mountain View, California, a mechanized kitchen forms pizza dough, applies tomato sauce, and moves pizza into and out of the oven. Automation in the food industry isn’t exactly new. As Solomon observes in Ecclesiastes 1:9, “There is nothing new under the sun.” Machines have washed dishes and brewed coffee for decades. And in the early 20th century, “automat” cafeterias served hot food when customers fed a coin to open a glass door. Food service gadgets usually weren’t seen by customers. Now moto-kitchens take center stage. At Spyce, dozens of gears, sensors, and moving parts are the real draw. Food processing machines are both speedy and healthy. “Our robot doesn’t get sick,” Knight says. However, machines have a harder time handling fresh food. At both Spyce and Zume, humans must do the trickier work—cutting meat, layering toppings, reducing sauces, and adding garnish. Then there’s the economics. Paying a human to chop and mix is cheaper than buying a bot for those tasks. That could change as businesses develop cheaper and more efficient robot chefs. Even so, not all robots successfully contribute to customer satisfaction. 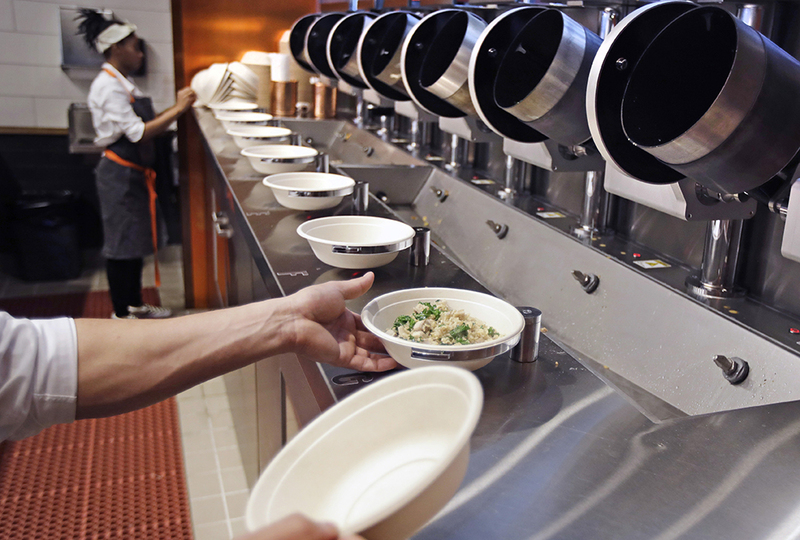 In Germany, a robotic system to deliver meals from kitchen to table ended in a pile of backed-up pots. 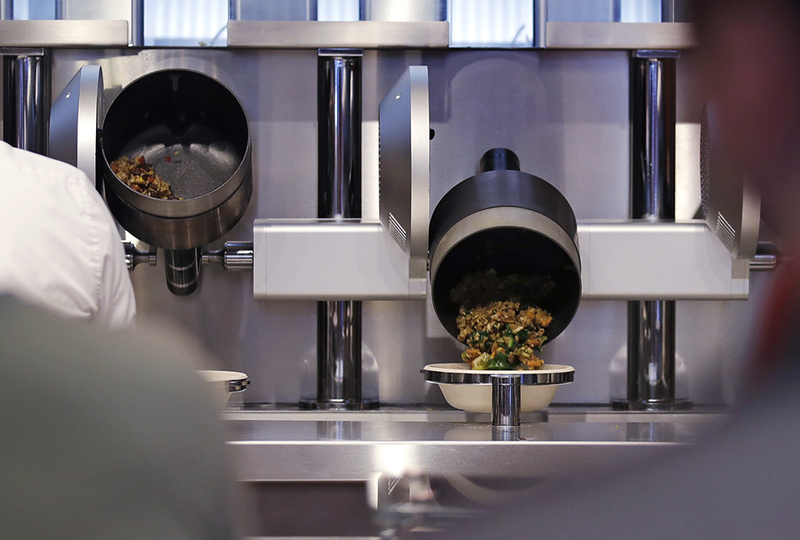 In March, a burger-flipping bot in California turned patties too slowly for customers’ tastes. Yet the lure of watching machines twirl and toss has folks lined up at Spyce. But is this a robot chef or just another high-tech novelty machine? Maybe so. But Ryden admits he’s eager to join the crowds to try the non-robots out. This is good because these machines do make jobs. Think about this. Who makes the robots? Who works maintenance when they break down? These call for more jobs in those areas. Who programs the robots? And where does the extra power needed come from. engineers, programmers, mechanics, and people working in power plants could get more from these machines. and more jobs in those areas. Right now in history, everything is robotic, and everyone loves robotics. But I do think that this will effect jobs. But then again, maybe not, because someone needs to keep up the robots so they don't get contaminated or rusted. Robots can't be completely trusted, however. The engineers could have installed cameras or a listening device to maybe find a flaw in what the real chefs and cooks do and make a big announcement about how we need to replace people chefs with robots, therefore turning the customers toward the robots instead of the real people. Actually, robots are usually more accurate then humans. Think about the self driving car, which is actually safer than a human driving. And the jobs issue usually fixes itself. Think about when tractors became a thing. Then tons of people lost their jobs, but new jobs in the city became available. my DAD is a farmer and tractors are a huge advantage for people like my family we have lots of fields and I have memories as a kid (of a younger age) I would sit in the tractor with daddy and we would listen to the radio <3 AND REALLY LINCON!?!? LOL!!!! I don't know about this. I mean, I'm not so sure I want robots messing around with my food. Of course, my mom has a bread machine, Vitamix, and a juicer, and those are fine. I just don't want, like, MACHINES doing everything. Wouldn't there be different chemicals in the metal of the machine, like ones that could make you sick? I don't like this idea. I don't know about Ultron (sorry Lincoln, although funny) but one really good hacker could make cutting machines go haywire. You know what I don't quite understand is of how everyone is concerned that people are becoming more lazy (I mean....don't get me wrong, that is a problem that should be addressed.) but doesn't anybody every wonder what will become of our virtues. Our honor? Our creativity and imagination? Like, if robots take over the world then suddenly humans aren't exercising that part of their characteristic that God gave us for a reason. Half of the fun of cooking and baking is the reward of eating something that you specifically created. If gives a completeness to our human nature. The pride that comes with a job well done and pride that comes from others praise of what you made. This is what I think about whenever I hear that robots have taken over another part of the human life.